Engines rev, power cells whine, saw blades spin and loading mechanisms snap chunky shells into deadly experimental weapons. Meks make last-minute adjustments with hammers and wrenches. Da Speedwaaagh! is on! 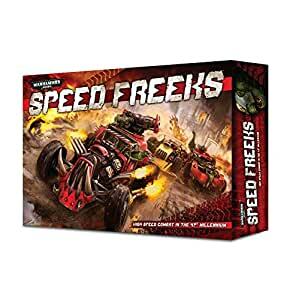 Speed Freeks is a game for 2 or more players. Each player commands a Speedmob of Ork wagons and warbikes in high-speed adrenaline-fuelled combat. Youâll need to kustomise your vehicles and pull off daring manoeuvres to win, but that isnât easy when your team consists of velocity-addicted greenskin maniacs. Players take turns picking models to move, shoot and attack up close, aiming to destroy their rival racers and become the greatest Speedmob in the galaxy!